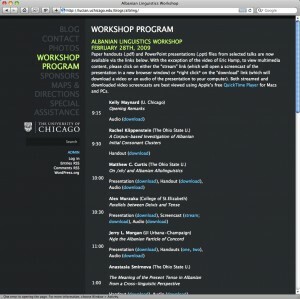 Conference on Albanian Linguistics hosted at the University of Chicago on February 28th, 2009. Elite WordPress theme (outdated). This is a very simple, but effective site with separate pages for all conference related issues such addresses, the conference program, directions, sponsors etc. The post features of the blog are not being used at all and the blog page has been set to re-direct to the workshop program / conference schedule page (in most themes it is possible to turn off unneeded pages in the site menu). Of especial note on this site are the links to audio, videos and screencast recordings for each speaker as well as links to downloadable PowerPoint files and PDFs of their handouts. The multimedia files from the conference accessible on the site were prepared with Podcast Producer. The same files were then re-used and placed on in the CEERES album on the university’s iTunesU site for easy download and syncing to a mobile device such as an iPod. Unfortunately it is not advisable to use this particular theme today since it has not seen any updates for several years. Please follow this link to see other model conference websites using a variety of different readily available WordPress themes.